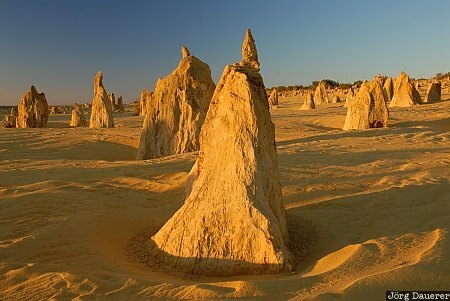 The Pinnacles in the desert of Nambung National Park illuminated by warm evening light. Nambung National Park is near Cervantes north of Perth, Western Australia, Australia. This photo was taken in the evening of a sunny day in March of 2007. This photo was the image of the month in September of 2016. This photo was taken with a digital camera.